The Gathering Place was founded in 2003 by a concerned group of citizens to provide hot meals to those in need. It opened its doors on September 5, 2003 and served 23 lunches. In its first year of operations, The Gathering Place served close to 20,000 meals. Between 2008 and 2010, numbers grew to a peak, hitting 30,946 lunches served, as the recession hit our community hard. As the economy started to recover during 2011, the number of meals started to drop, although they never returned to pre-recession numbers. In the summer of 2011, The Gathering Place was a recipient of a Trillium grant, allowing it to turn a City-owned brown-space into a lush Community Garden space. 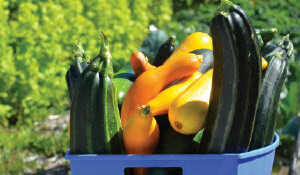 Produce grown at the garden is used in The Gathering Place’s drop-in meals. February of 2014 saw The Gathering Place participate in its first annual Coldest Night of the Year fundraiser, our single largest fundraiser to date, which raises close to 25% of our annual budget each year. First, the Breakfast program was launched, serving breakfast two days a week. It quickly became apparent that service needed to be increased, leading to The Gathering Place serving 4 days a week in November. October 2014 also saw The Gathering Place officially launch its Food Rescue Since its launch, The Gathering Place estimates over 10,000 lbs of food have been rescued and used in our drop-in meal program. November 2014 marked the beginning of a pilot Community Kitchen, initiated in partnership with the North Bay Parry Sound District Health Unit, in an effort to improve food skills in food-insecure households. The autumn of 2015 has also proved to be another busy season. In September 2015, The Gathering Place introduced a family-based Community Kitchen program called Healthy Families Cook Together. This program allows parents and children aged 8-12 to learn important food prep and nutrition skills, while spending quality time and sharing a meal together. The Gathering Place is currently developing a variety of Community Kitchen programs intended to serve a wide range of participants. October 2015 saw a few additions to our programming including adding breakfast to our Friday mornings and our first monthly birthday party for our drop-in participants! October also saw the release of our first graphic annual report, as well as our new gift catalogue! In October 2016, The Gathering Place began serving dinner three nights per week, on Mondays, Fridays, and Saturdays.